Features: Michael Cheika heading back to Europe? At least you can't say the new Wallabies coach, Ewen McKenzie, is playing favourites. His decision to select Matt Toomua ahead of Quade Cooper was difficult to predict, particularly due to McKenzie's close link (no, it's not a pun) with his Queensland Reds playmaker, but it shows that form not reputation is imperative. McKenzie's decision to choose 10 Brumbies in his Bledisloe Cup team - six in the starting line-up, four on the bench - is wise, indicating that he has an open mind. Such a healthy representation is reward for an excellent Super Rugby season, and ensures almost half of the team is close to match fit- as their provincial season finished less than two weeks ago. The promotion of Toomua to the Test ranks for such a tough initial international is warranted. When McKenzie took over as Wallabies coach, Cooper would have been his first choice at No 10. 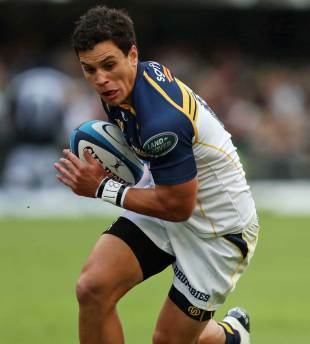 But Toomua's performance in the final weeks of the Super Rugby tournament - in particular the semi-final triumph over the Bulls in Pretoria - were substantial indicators he was now up to Test standard. That would have changed the pecking order. Toomua has poise, never looks stressed, does not cause problems in the defensive line because there is no need to hide him, and will feel comfortable because of familiar faces around him, in particular Christian Leali'ifano at No.12. Toomua will play deeper in attack than would Cooper, but that could lessen the strain on those outside him. As Toomua and Lealiifano are reasonable midfield kickers, it also gives the Wallabies options if they want to mix up their play. Also Toomua could easily distract his opposite, Aaron Cruden, especially if, as in the Super Rugby final, he continues to rush up on the Kiwi in defence to limit space. Still, expect Cooper to play a substantial role in this game, and it would not surprise if he is on the field before the half-time break. James O'Connor has also returned to the more comfortable position of wing, with the only major question mark out wide revolving around new fullback Jesse Mogg, and what sort of game he will play. If he adopts a relentless kicking game, which was rammed down his throat by Brumbies coach Jake White this season, the crowd will probably start heading for the exits at half-time. If he takes a more adventurous role, we may at last discover whether Mogg is the complete player. This Test will be crucial in determining whether Mogg has a long future at the top level. Up front, the most refreshing selection is that of Hugh McMeniman at blindside flanker. McMeniman, sadly, was a squad onlooker during the British & Irish Lions series, in which his "mad dog" attitude was sorely missed in a fluctuating Wallabies pack. He is the perfect up-front warrior needed to provide some sort of resistance to the All Blacks' marauders. Forget about his long absence from Test football; this is the type of encounter that McMeniman relishes. As encouraging is the sight of Scott Fardy and Scott Sio on the reserves bench. Sio is the most promising Australian prop, by a long margin, and Fardy could easily be as effective as McMeniman. In the final month of Super Rugby, Fardy was the most penetrative Australian lock. Overall McKenzie has opted for a fair selection process, rather than a forced one. You can't quibble with that. Australia: Jesse Mogg; Israel Folau, Adam Ashley-Cooper, Christian Leali'ifano, James O'Connor; Matt Toomua, Will Genia; Ben Mowen, Michael Hooper, Hugh McMeniman; James Horwill (captain), Rob Simmons; Ben Alexander, Stephen Moore, James Slipper. Replacements Saia Faingaa, Scott Sio, Sekope Kepu, Scott Fardy, Liam Gill, Nic White, Quade Cooper, Tevita Kuridrani.